Medals can be won, careers can be made and hearts can be lost in the sixteen days of the Winter Olympics. 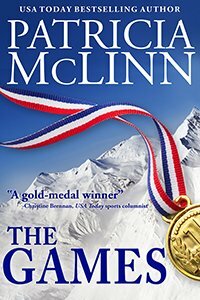 Tess Rutledge, once an Olympic champion figure skater, returns to the Games as a coach, encountering her first love — and only heartbreak — and testing her ability to forgive. Alpine skier Kyle Armstrong has made a terrible mistake that could cost her a shot at Olympic gold as well as any hope of reconciling with the man she loves. Biathlete Rikki Lodge thinks she’s just happy to be at the Games, until she meets a hockey player who demands that she do what she’s never done before: put it all on the line. “THE GAMES accurately portrays the emotional roller coaster an athlete rides in pursuit of … Olympic Glory. “Tess! Thank God!” Ron Sheffield, the team leader, caught her as she followed Amy to the women’s locker room. She could tell who among the skaters, officials, coaches and technicians littering the hall understood English–they were the ones who turned around and stared at her. A couple laughed. An hour and a half later, remembering Sheffield’s “or so” tacked on to the promise of another hour, she could have used the laugh. Amy had come in, freshly showered and dressed, and departed to watch another practice session, and still the interviews droned on. Leaning against the back wall listening to the international media question a pairs team from France she wanted to tell them all to lighten up. My Lord, this didn’t concern nuclear war or an assault on the environment or human rights. Although maybe there should be an international commission to study cruelty to skaters. The first people investigated should be the reporters. Not the ones who asked questions that revealed they didn’t know the difference between an axel and an edge– they were merely ignorant. It was the ones who asked skaters such as this stiff-jawed young man and his big-eyed partner what it felt like to have the world watching their every move and a nation counting on them to perform better than they ever had before for the greater glory of France– those were the dangerous ones. A merciful fate saved the young skaters–time was up. An organizing committee member and their coach shepherded the slightly dazed pair from behind the linen-draped table forested with microphones. As the introduction continued in the languages of the Olympics, Tess spotted Andrei. He stood at the front, broad shoulders braced against the door frame to the hallway, unobtrusive but situated so he could survey the field of journalists, yet make eye contact with his skaters if they sought him out. So different from that interview she’d seen him give eighteen years ago. He’d sat next to his partner, Tatiana Serginova, flanked by their coach and three members of Soviet officialdom. She’d stood in the back, as she did now, listening to Andrei’s voice, so devoid of life she’d hardly recognized it, and catching glimpses of his wooden face between the shoulders of journalists and hangers-on. She’d seen life in his eyes only once, for an instant, when he’d caught sight of her, and then it had been gone. That night, when he’d escaped all his handlers and they’d slipped off alone together, he’d told her never to come to one of his interviews again. At first, she’d thought he didn’t want her to see that side of him, the cold, public face she thought of as his Soviet identity. Later, she’d wondered if he’d already known he was going to choose that identity and betray her trust, her heart. Tess started, disoriented for an instant before she realized Amy had returned and that she didn’t refer to the Andrei Chersakov who existed only in Tess’s memory, but to Vladimir Metroveli. Vladimir pushed back a thick lock of hair from his forehead and Amy let out an appreciative breath. Tess thought he needed a good haircut. God, she was getting old. Maybe this infatuation didn’t run as deep as she had feared if Amy could be dispassionate about his skating. They’d been talking softly, but not softly enough for some of those trying to listen to the interview. Tess started steering a resistant Amy toward the rear door to the hallway. They really had to talk about this. When Amy’s resistance abruptly evaporated, Tess looked back and saw the interview had broken up. Vladimir said something to Andrei, who put his arm casually around Radja and walked between his two skaters, through the door and out of her sight as the next pair came in. He had not glanced once in her direction. Now Amy tugged her into the hallway. They arrived in time to see Andrei and his two skaters turn a corner and go out of sight. “Amy–” But they couldn’t talk about this here, with journalists exiting and entering the interview room, skaters and coaches crossing paths as one practice session ended and another began and officials going every which way. Amy turned rosy. More amazing, she seemed tongue-tied. I want to skate with you. I want to hold you on the ice, and kiss you. And then, every time I skate, I will hold you again. In my heart. It won’t matter. I will have you in my heart. Amy saved her from the memories. Andrei looked at Amy, who looked back at him, transparent. Tess detected no visible sign of the amusement she was certain he felt. Andrei made a noise, a sort of muffled bark, and she could see him struggling not to laugh out loud. She remembered that laugh. A deep-throated sound that had once swamped her senses. The skin at the back of her neck prickled. Andrei jerked away, not just his hand but his whole body tensed at her instinctive reaction. His eyes seemed to go blank, his face immovable. As if a switch had been thrown and the human being inside had evaporated. She remembered that face from eighteen years ago. The face he’d worn at that interview. The face he’d worn around anyone from his country. The face she’d come to think of as his public face; the gap between them in visible form. She’d forgotten how much she’d hated it. It struck her now– she’d been able to forget that because she hadn’t seen it these past few days. She’d been so ready to fight off the memories he stirred she hadn’t noticed the changes in him. Not until she’d caused this retreat behind his old facade. Her breath came out in a hiss of pain. Squeezing her eyes shut, she wished with all her might that it wasn’t so, even as she accepted that she still couldn’t bear to see Andrei Chersakov like this. Life returned to his face, though not the laughter. She let herself be reassured without acknowledging any distinctions he might be implying. It hurt to breathe, each draw into her lungs a burn right down to her heart. How could he expect to open the door he’d slammed so resoundingly? Didn’t he know how hard, how painfully she’d worked to build the brick wall that covered it on her side? She looked around, through the half-opened door she saw the two skaters behind the table start to rise, and went light-headed with relief. He allowed her to go. It worried her to know that it was a matter of allowing. Rikki and the two other biathlon team members at their cafeteria table groaned at Sharon Wagner’s comment. They’d been out by seven to “school the loops,” a twice-a day exercise of covering the course to learn its idiosyncrasies so well that they were second nature in a race. Then they’d done a light workout and some shooting to stay sharp before watching a women’s cross-country race, cheering on American skiers they often trained with. Then back on the course for another loop before returning to the Athletes Village for lunch. Rikki ate with three team members who were housed together here in the Olympic Village closest to the course. For the first time it hit her how much she enjoyed not rooming with the people she trained, competed and ate with every day. “If you think the altitude at this course is bad, you should have seen at Soldier Hollow – the Salt Lake Games,” Lois Welthur said to Rikki and the fourth member at their table, Jane North, as if they wouldn’t recognize the venue from the previous Olympics, even though they hadn’t been there. Not too bad, Rikki thought. Only the second reference to previous Olympics by Lois during the meal. She didn’t let anyone forget that she’d competed in those Winter Games–and Rikki hadn’t. Not making the Olympic team her first try had been a disappointment, not making the team the next two times had been much, much worse. But she’d never get anywhere if she hadn’t learned how to keep disappointments from getting her down. Even with Lois dredging them up. They’d guessed at the starting time and got to the hockey center early, finding seats not far behind the USA bench. While they waited, Jane gave Sharon and Rikki a crash course. “How do you know all this about hockey?” Rikki asked her. Applause from the crowd still filing in brought Rikki’s attention to the American team, which had appeared for warm-ups. The heavily padded uniforms and helmets made the players as indistinguishable as kindergartners in identical snowsuits. She started to reach for the program she’d tucked into her bag. And stopped. One player lifted his head and she looked right into the dark eyes of Lanny Kaminski. She didn’t need a program to know they were his eyes. He didn’t wave. He didn’t smile. He didn’t blink. He just looked. And she looked back. Then a teammate jostled him and he turned away. And never looked her way again. Had he even seen her? Maybe the trio of U.S. team jackets had caught his eye and he hadn’t seen her at all. Or maybe it had been one of those unintentional stares that indicate a total internal focus. When he started to play, she became convinced her second “maybe” was right. He seemed attuned to every move on the ice and nothing beyond it. He barreled down the length of the rink like a freight train. He crashed into an opponent with an impact that took away her breath as well as the other player’s. Then he stole the puck with an agile swipe that would please a cat, and immediately passed off to a teammate. Once an opponent checked him and he couldn’t stop his momentum, tumbling over the other player’s shoulder and landing on his back in a flip. The play never stopped. Before her stomach finished somersaulting, he got to his feet and went after the puck. When his line came off the ice to let the next shift on, he prowled the bench area, exhorting and instructing his teammates. He spent a lot of time with the player with “Tonetti” across his back, but satisfied himself with a clap to Sweet’s shoulder. He swallowed some water, then yanked off his helmet and poured the rest over his matted hair and sweat-streaked face, never taking his eyes off the game. Each time he returned to the ice, he seemed to leap into the play with fierce pleasure. Even after he’d caught an elbow to the face that let loose a stream of blood from a cut over his eye. “You okay, Rikki?” Sharon asked sometime in the third period. “I’m fine.” She avoided the urge to shift again. That hadn’t relieved the strange edginess she’d been feeling, anyhow. Lanny Kaminski controlled the puck less often than several other players, yet Rikki found she followed him instead of the play. Even before the crowd’s roar she knew each of the three times the U.S. team scored by his reaction. But even in the game’s waning seconds, with a three-to-one lead, he remained just as intense. The final horn sounded, and the U-S-A, U-S-A chant went up. “That was great! Wasn’t it great, Rikki?” Jane shouted across Sharon, still standing and hollering. “Yeah, great.” She smiled at Jane, consciously relaxing her muscles. What else it had been she wasn’t at all sure. Amy just gave her a look. Apparently it didn’t matter if you were one of the top figure skaters in the country, possibly the world. At fifteen, you didn’t want to enter a roomful of strangers alone. “That’s great. Just give me fifteen minutes.” Amy dashed out. Tess had found time this afternoon to place a call to the Yosts, which confirmed her impression of Mikey Sweet’s reliability. Kyle Armstrong had made the biggest mistake of her life four weeks ago tonight. She’d made mistakes on the course; no skier hadn’t made a mistake or two. You tried to keep those to a minimum, though, because the wrong one could kill you. This mistake hadn’t come on the course. And it couldn’t break her neck or leg. Just her life. She couldn’t even claim she didn’t know what had possessed her to sleep with Brad Lorrence, darling of the men’s downhill. She’d always been fond of him. He was easy to be with, because he never demanded anything of her and accepted whatever surface she chose to present. And he made her feel desirable–something she’d sorely needed of late. He’d chased her, in his desultory way and with frequent distractions for other conquests, for years. Despite the media casting them as America’s Olympic sweethearts, though, she’d had no inclination to let him catch her. Not until that night four weeks ago at the party to celebrate being named to the U.S. Olympic team. She could still taste the blended exhilaration and despair. She was headed to the Olympics. A dream realized. Rob Zemlak was her direct coach. A nightmare to be lived through. Of course Rob had been around before; he’d been an assistant ski coach for the U.S. women’s team for nearly two years. But not in such close quarters. And not when she should have felt only the thrill, without this rock of hurt in her gut. She’d needed warmth that night, and Brad had offered it. She hadn’t made a conscious decision to let what happened happen. But she had let it happen. And she could rail at the fates all she wanted that it was only one time, and she had insisted he use a condom so how could she possibly have gotten pregnant? It didn’t change that she was. And now she had the consequences to face. She wanted to refuse, Lord, she wanted to refuse. To be left alone, to slip into the oblivion of sleep where she didn’t have to face consequences or regrets. But she couldn’t afford to rouse Nan’s suspicions any more. With the bathroom door closed behind her and the water running, a pain splintered through her abdomen, making her clutch the sides of the basin. She’d been prepared for the nausea, but these pains the past several days were something else. The nausea had started almost immediately. Otherwise she might not have suspected for quite a while. Like a lot of athletes, her periods were more erratic than cyclical. She wouldn’t have thought anything of missing a period, if it hadn’t been for being nauseated so much. The day she should have started and didn’t, she’d taken a bus to the next town over from where the ski team had been staying. It had taken two tries to find a pharmacy that had one of those home pregnancy tests. It had a layer of dust on it and instructions in six languages, but that’s all she found. Locked in the bathroom, with Nan off being Nan, she’d carefully followed the directions. There it was, big as life, exactly the way the pamphlet said it should look for someone who was pregnant. She’d sat on the cold tile floor for hours. Finally, she’d placed a trans-Atlantic call to her old family doctor. He said to tell the team doctor. She’d refused. He pointed out that if she were selected for the drug tests at the Olympics, which she surely would be if she medaled as everyone said she would, they could easily find out anyway. But she’d figured they would be looking for steroids or other banned substances, not pregnancy. Besides, the tests were done after the races. And after the final race, Rob Zemlak would have no right to know. And she wouldn’t have to see his face when he found out. So the old family doctor, too wise to suggest telling her parents, had sighed deeply, told her the tests weren’t one hundred percent accurate but to use common sense. She was perfectly healthy and chances were her pregnancy would be perfectly normal. Call if she had any questions. She hadn’t called back when the pain started. Maybe this was normal. And if it weren’t, he’d just argue more about her telling the team doctors. Who would tell Rob Zemlak. The doctor had also told her that vigorous exercise would do absolutely no harm, with the mother accustomed to expending that level of energy. And that she was. For fifteen years. Day after day, week after week. All to get here. All for a shot at the bit of medal that Rob had said she could have bought with her allowance as an eight-year-old. But that she could only earn now, as a twenty-three-year-old. All for this. The pain subsided enough for her to straighten and splash the tepid water on her face. Mikey Sweet claimed Amy at the door. But Rikki had already seen something. In the dim light beyond the group of hockey players clustered around the pinball machines, one figure sat alone before a video game, maneuvering the control with complete concentration. “Thanks, but I see some friends over there. You guys have fun.” She caught Mikey’s arm a second and said quietly, “I may not stay long. Keep an eye on her and get her back at a decent hour.” He nodded, and she headed toward some French cross-country skiers she’d met. They were on the opposite side of the room from the intense, solitary figure by the video game. Half an hour later, after dancing with a Finnish speed skater and talking to a Canadian ski jumper, she found herself near the video games. Amy still reigned at the pinball machines, but Lanny Kaminski was nowhere to be seen, not even in the shadowed corner he’d occupied earlier. Curious, she sat at the game he’d been playing, and dropped in a token. After one game she didn’t know much more than that it had something to do with guiding a Viking ship through fjords and past other dangers. She put in a second token. Her second ship was sinking–she’d gotten too close to the fjord wall–when she heard a low voice behind her. Not bothering to turn around, she dropped in another token. He lapsed into silence, but he didn’t move. She heard his occasional sounds of disapproval at her haphazard play, and she could feel his presence behind her. The more he restrained himself, the worse she felt for her churlishness. She’d sunk another ship and another token before she spoke, though. “Yeah.” He hesitated long enough to make her wonder if that was all. “I saw you there.” He sounded puzzled and not entirely happy. Fun? Not quite the right word. “Let’s say interesting.” And a little unsettling. He said it so flatly it took her a moment. Then she looked up at him. His dark brows were drawn down in a frown and his eyes were intense. But not with the same emotion she’d seen in them this afternoon at the hockey rink. The game beeped at her, waiting for her next move. The words died under the burning light of intention in his eyes and the weight of realization that his mouth practically touched hers. She was drawing in breath when he kissed her, craving sense-restoring oxygen and instead drawing in his scent and leaving herself slightly light-headed. It was a brief kiss, a shifting of lips against lips, a fleeting fluke of proximity. And it rocked her. He lifted his head. Still half leaning over her, his one hand rested on her back, the other around her neck. She held on to that wrist, with her other hand caught between her shoulder and his chest. They stared at each other, stunned and wary. She wanted to be amused, but his profane mutter too aptly fit her own reaction. His expelled breath across her dampened lips made her shiver. He saw it, and swooped down to kiss her again. No fluke, nothing fleeting. A smoldering fuse of a kiss that parted her lips and welcomed his tongue to light dynamite deep inside of her. She shifted to free her hand. Slipped it around the back of his neck to explore the texture of his hair–softer than she would have expected–and pull him closer. He tightened his hold on her, drawing her up from the chair. She could feel his hip against her abdomen as he shifted so one of his legs slightly parted hers. Instinctively, she moved against that pressure. She heard his words above the ringing in her ears. Felt the tug on her hand and accepted it as he led her directly across the dance floor and out the door. Felt him drawing her parka around her shoulders, guiding her arms into the sleeves, and she accepted that, too. But the slap of cold air against her face brought her back some, and turned down the volume on the ringing. Or maybe his gloved hand on her parka sleeve didn’t allow for the skin-to-skin contact that had set off that ringing. Either way, sanity made a comeback. She should welcome that, not regret it. Because this was crazy. Lunatic. She needed a moment to catch her breath. To think. To slow everything down. “Lanny…. Wait.” She tugged back on his hand. That struck her as a reasonable question, which scared the hell out of her. A stupid question. She knew where they were going, at least in general terms. He could have said that in so many words. He could have demonstrated with an embrace she knew she would have returned with full enthusiasm. “This is crazy!” Was she appealing to herself or him? “Crazy isn’t the half of it.” He sounded almost grim. She shook her head, trying to clear it, not disputing his words. He didn’t try to pull her closer. Only their gloved hands connected, their arms stretched to full length. They stared at each other. But instead of catching her breath she felt it coming harder, felt her heartbeat speeding. She couldn’t think; she didn’t want to slow. If that was going for broke, she was going. He halted her progress, by the simple expedient of refusing to budge. He didn’t answer, instead bundling her backwards into a dark alcove between a building and what she suspected was a dumpster. It didn’t matter, because he immediately followed, pressing his body into her. His mouth covered hers, and it was dynamite all over. He deserted her mouth, and used his teeth to draw off one glove. His hand tunneled under her parka, under her sweater and up her back, the cold air pouring in as his arm lifted the material. But his hand burned against her skin. He unhooked her bra with one jerk, and his hand found her breast immediately under the loosened material. She pushed her upper body closer to his touch. In response his hand tightened on her breast, and his other hand dropped to her fanny to rock her pelvis against his. Her mind couldn’t formulate more. But her body wanted more. Wanted the feel of his bare skin under her hands, wanted him inside her. Now. And he knew it. He backed off enough for them to lock eyes. Rochelle Lodge, who didn’t do things like this –ever– who believed in caution and gradual, met his look. … Fourteen more days to go in the Winter Olympics that will change Tess, Andrei, Kyle, Rob, Rikki, Lanny, Nan and Amy forever ..
Or you can order THE GAMES from your local independent bookstore.